At Mobile World Congress 2018 we saw a future full of 5G-based applications for where we work, live and play. With these new applications, communication isn’t one-to-one anymore. App downloads, software updates, sending advertising to digital signage, and connected cars are driving new communication patterns. Wider use of video on mobile devices will increase the need for broadcast and multicast technologies to alleviate bandwidth demands on networks. Mission critical and other IoT apps will use many-to-one data collection in the upstream direction to report data or video from many monitoring points to a central location. End users (people or things) may need to simultaneously access multiple applications or content domains located in different places to complete their tasks. Similarly, individual users may upload information to a cloud application that is accessed by many other users. In all these instances, we can see how applications require rapidly changing any-to-any connectivity – in other words, dynamic interconnectivity. Can our transport networks deliver? 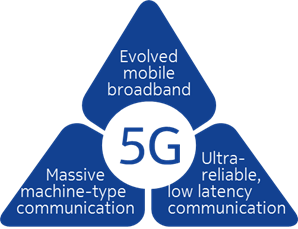 The lead applications for 5G fall into three categories: evolved mobile broadband (eMBB) for amazing multi-media experiences, ultra-reliable, low-latency communication (URLLC) for mission-critical device control and massive machine-type communication (mMTC) for the Internet of Things. For eMBB, traffic volume will increase exponentially because of demand for high-definition video, augmented and virtual reality, and real-time gaming. Users expect faster, higher-quality experiences with ever-improving visual, audio and potentially tactile interfaces. Over-the-top application providers such as Netflix are already placing content caches in datacenters closer to users. They also use various schemes to minimize cost by taking advantage of off-peak capacity to move large volumes of data around the network. It isn’t just content that needs to be stored closer to users. Computing resources need to be placed here as well. For example, autonomous vehicles at intersections will exchange data with other vehicles and with roadway infrastructure such as traffic lights and cameras. Local analysis and processing of that data is needed to achieve the low latency, ultra-reliability and security that is required for safe and efficient traffic flow. Mobile networks traditionally had radio functions near the antenna and mobile processing functions at a centralized core. Today, mobile network functions are being split up, distributed and virtualized to provide the best combination of latency, throughput and cost effectiveness for various potential applications. Operators can run radio functions in large centralized data centers, smaller distributed sites, or a combination of both. Cloud-based functions are dynamic in nature and can increase or decrease in scale as needed. This means traffic volumes will also dynamically scale up and down. Mobile traffic, whether it is user traffic or control messages, must be dynamically routed to various processing points. This routing must be flexible so that it can make the appropriate real-time adjustments. What will your transport network look like? To accommodate these requirements at scale, operators will need IP routing that encompasses IP, MPLS and segment routing protocols across the transport network – right out to cell sites and business demarcation points. Upgrades for multigigabit cell site connectivity are required. The access and aggregation layer requires high GE and 10GE port density and 100GE throughput to accommodate increasing numbers of connectivity points and traffic volume. It requires fast reconvergence to keep up with changing network implementations and provide resiliency. A uniform, end-to-end IP routing environment provides all this plus operational simplicity, faster problem resolution, and easier service implementation, reporting and management. 5G-era applications are changing traffic patterns and volume on transport networks. High-capacity IP routing is a key underpinning for the dynamic interconnectivity required between centralized and distributed content and computing that makes our mobile communications and applications run flawlessly. Visit our website to learn how Nokia IP Anyhaul solution can help you get to 5G faster by supporting dynamic interconnectivity and new applications. Or learn more about our whole end-to-end 5G Anyhaul solution. Ellen leads the marketing for access and aggregation routers at Nokia. Outside the office she pursues her passions for the performing arts and wilderness adventures.